Your hazmat containers should be compliant with local and federal regulations for the highest safety standards to be met. Depending on what hazardous materials you store or intend to store, you should have hazmat containers designed specifically for them. This practice ensures that your hazmat containers have all the proper safety accessories to maintain your hazardous material. The best protection when it comes to hazmat storage is to know what hazards are associated with your materials, and to prepare for them. U.S. Chemical Storage has a few tips on storing your hazardous material, and how to choose hazmat containers that are right for you. For safe, protected hazmat storage, it is essential practice to learn about the material you intend to store. This means studying a Material Safety Data Sheet (MSDS) and learning about chemical characteristics and hazards. If a hazardous material is flammable, explosive, or corrosive, the MSDS will say so. Once you know the hazmat’s melting point, boiling point, and (if flammable or combustible) flash point, you have an idea of what environment your hazardous material requires. A hazmat storage container’s climate control system can serve to maintain your hazmat by keeping the storage’s temperature and moisture at a steady level. This will prevent decomposition or melting due to heat. If the materials are flammable, combustible, explosive, or oxidizers, it’s a good idea to equip your hazmat containers with fire suppression systems in case of a fire. This can enable your personnel to combat fires for their own safety and – if they can do so without coming to harm – to minimize damages to inventory. Always make sure emergency responders are aware of what hazardous materials you have on hand and what hazards they present. 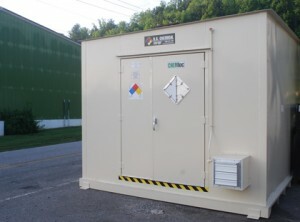 For total compliance in hazmat storage, we offer fully customizable hazmat containers. We can help you determine what features your hazmat container needs (or doesn’t need) to design a custom hazmat container that’s safe, protected, and 100% compliant. Your hazmat container will come equipped with secondary containment to prevent hazmat leaks and spills from escaping into the environment. You can also equip your hazmat storage container with any of our optional accessories such as mechanical ventilation, climate control, and explosion relief construction for the highest level of protection. If your hazmat storage is prone to the production of toxic or corrosive fumes, you need accessories to mitigate the hazards associated with fume buildup. As always, U.S. Chemical Storage is dedicated to bringing you the safest hazmat containers in the industry. We are determined to deliver you the highest quality product, custom-built to your specifications, helping you remain safe and compliant. Our hazmat containers are FM and Warnock Hersey Approved, so you know you’re getting the most protection from your structure, brought to you by a name you trust.